Procrastination. I have been doing it a lot lately related to writing this blog post and others of recent trips. I often hear from those I share these wonderful adventures with that I take forever to share the photos. I can’t disagree. I tell them I should be getting that post and the pics up real soon. A month later and it still hasn’t been done. Sometimes a minor epic or mishap gives you a narrative to write about. Other times you are feeling inspired and the writing comes easy. Neither were or are present from this particular cold winter descent. This does not mean the experience was any less special; it’s just that much harder to write something special about. In such a case it seems easier to do the dishes or clean up my son’s toys then sit down and write. So why chronicle every or nearly every trip? (A few have in fact been left out over the years for various reasons). I often ponder this, but always come back to the same conclusion. Life is short, but has the potential to be filled with the most amazing of experiences. For me those most special of experiences come from three main sources: family/ friends, my work and wilderness. I am extremely lucky to be blessed with health, an incredible family, a job I love and the ability to somewhat regularly venture into and experience wilderness. We also live in a modern society where everything is recorded with 0s & 1s. They often are quickly shared and seen. From here this content resides many posts back in a Facebook account or on a hard drive literally collecting dust. Maybe actual photo albums are becoming a thing of the past, but for me this blog serves as an archive of these experiences. It is always there and not withstanding some sort of viral attack of the interweb, should always be there. Specifically, this wordpress blog allows me to organize these trips into various categories so they are logically searchable, such as features as the linkable canyon index. The blog allows me to feel close and connected to these adventures of the past. For this I will due my best to keep procrastination at bay and continue to committ to this personal archive, maybe just not in the most timely of fashion. A few quick notes on this recent frigid jaunt down Big Kahuna Canyon in the Mazatzal Mountains. Nearly two years earlier, Laura, Wyatt and I ventured out for the same trip. At the time Wyatt, just over a year old, rested on my back in a baby backpack as we joined Laura for the hike up the Barnhardt trail to the start of the technical canyon. We waved goodbye to Laura as she joined our friends for the canyoneering descent of Big Kahuna as Wyatt and I hiked back down to the trailhead. This time the roles were reversed. Wyatt, now over three and probably nearly 20 pounds heavier, himself said, “Goodbye.” and “They’re going canyoneering.” as we headed into the canyon and Laura and Wyatt hiked down the trail. Not much to mention about the smooth descent itself other than the gorgeous rappels through moderately flowing water, past swirls of unique geology. Great company too and we were back to our vehicles rather quickly. Just enough time for the winter desert sun to dry out the muddy road just a tad before heading home. David and Wyatt on the hike up the Barnhardt Trail. Nearing the start of the technical canyon, Wyatt gets on Laura’s back and they head down the trail as we head into the canyon. Katie heads into Big Kahuna Canyon. 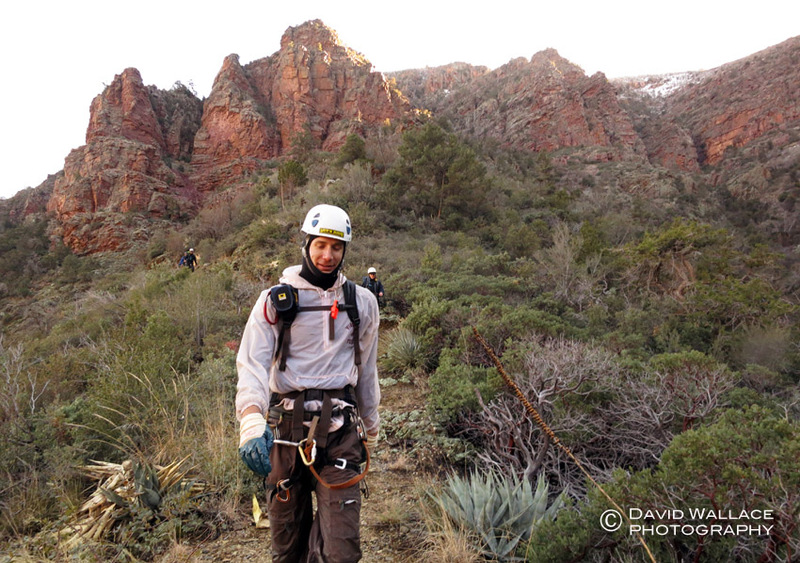 Cody on the first rappel of the canyon. Brian wades through chest deep water. Brian sports his awesome newly custom designed helmet. Brian rappels by a swirl of geology. 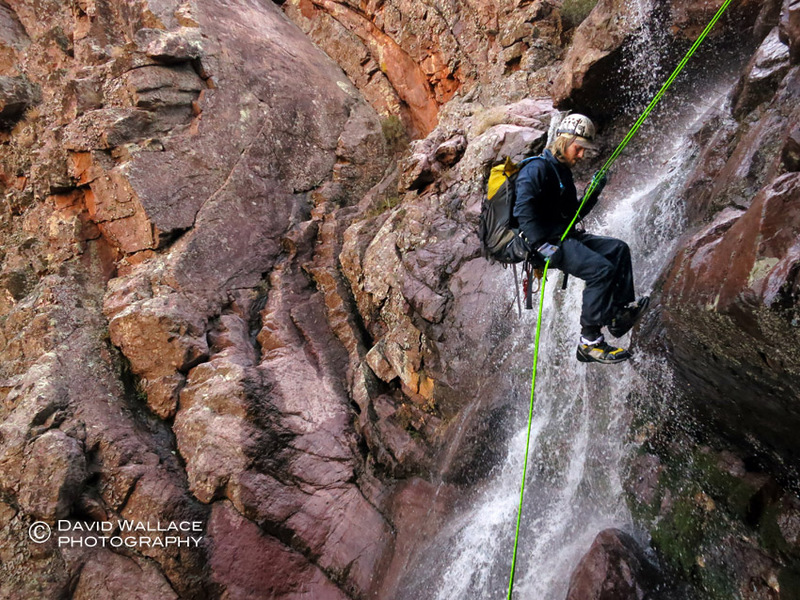 Katie rappels between three district falls. David reacts to icy cold water. Cold enough and close enough to our vehicles we hightail on the trail without stripping out of our wetsuits.